So the clinical trials, the understanding of FDA regulations, the patent protection all came together for us. We made about a 15x return on Adams. 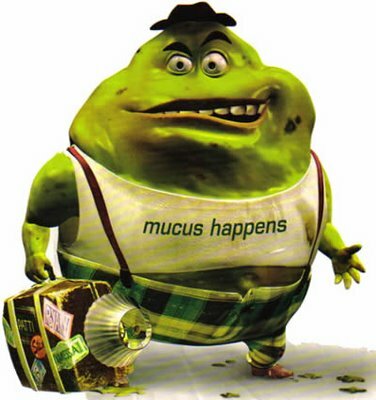 The “Adams” he’s talking about is Adams Laboratories, Inc., the company that brought you Mucinex and this guy..
Mucinex, the No.1 OTC expectorant in the USA, is a long-acting guaifenesin product and the only FDA approved 12-hour expectorant. Hmm…. the only FDA approved 12-hour expectorant? What’s going on here? Well, after a little digging a very interested story came to light (I got much of the background from this excellent Harvard Law paper by Tammy Muccio). First, we need a little context concerning drug regulation laws in the US (I’ll try to keep it short and to the point): The Food, Drug and Cosmetic Act (FDCA) was first passed in 1938 as a means to ensure that consumers were not exposed to unsafe (you guessed it) foods, drugs or cosmetics. The regulations only concerned unsafe drugs, not ineffective drugs. It wasn’t until 1962 that the FDCA was amended and drugs were required to be both safe and effective. Great, right? Well, now the problem was, what should we do with all the drugs that were currently on the market that don’t have efficacy data? To address that question, the FDA decided to initially grandfather these drugs and in the meantime initiated the Drug Effectiveness Study Implementation (DESI) program which would examine the available data and hopefully help the FDA classify the drugs as either safe and effective or not (not a small task in the least). For OTC products, the FDA initiated the “OTC Monograph Program” in which the FDA evaluated current OTC ingredients for safety and effectiveness on a class-by-class basis. If you were an OTC drug manufacturer, you could continue to sell your product as long as you registered with the FDA and complied with the monograph and manufacturing standards. It wasn’t a perfect solution, but considering the task at hand, it was a pretty good compromise. Fast-forwarding to 1983, E-Ferol, an unapproved IV preparation of vitamin-E for premature babies results in the death of a number of newborns. This reinvigorated the FDA and made them take a second look at all those grandfathered drugs, guaifenesin included because, at the time, it was a Category III drug (“insufficient data to establish safety and efficacy”). Eventually in 1989, guaifenesin was moved to Category I (“generally recognized as safe and effective and not mis-branded”). So everything is fine, right? Not quite. A few years later the FDA got on a new kick and started targeting extended-release drugs of all kinds (and with good reason). Guaifenesin extended-release products were now on the FDA radar. Based on data from IMS Health—NPA TM , we estimate that, for the 12 months ended June 30, 2003, there were approximately 10.5 million prescriptions filled for long-acting, single-ingredient guaifenesin products. After November 2003, we believe that a majority of prescriptions written for long-acting, single-ingredient guaifenesin resulted in OTC sales of our Mucinex SE product. Humibid SE is now also available to meet this demand in a maximum strength formulation. So it all starts to make sense at this point. Adams Laboratories simply figured out how to help the FDA with their goals (getting unapproved drugs off the market) and at the same time turn a profit. Pretty remarkable if you ask me. As a final point, I’ll leave you with this: If you think this is a smart business model to emulate, tread carefully. A few other companies have tried the same thing. URL Pharma did it with colchicine (Colcrys) and most recently, KV Pharmaceuticals did it with a progesterone (Makena) and it didn’t turn out quite so well. A quick google search will give you the story on those drugs. I think the window closed a long time ago on this business model. The trashing of Dedreon’s stock price happened less than 24 hours ago and a lot of speculation is underway as to why they missed their revenue target. Ed Silverman over at Pharmalot just posted an interview he did with a Los Angeles urologist where he tried to find out if reimbursement concerns are the real issue behind the lagging sales. It’s an excellent article and I encourage you to read it. I won’t spoil the punchline from Ed’s article, but it appears that Dendreon’s mistake is one that a lot of start-ups make. It’s a hard lesson to learn, but I think we can all benefit by reminding ourselves: “It’s not about the product, it’s about the customer.” It’s something that we often forget about in biotech where the “wow!” factor of a new drug can overshadow the fact we still have to get the drug to the patient. Matthew Herper’s “The Medicine Show” blog on Forbes.com has a new series of posts on fixing pharma’s R&D machine. One post in particular caught my eye, “Seven Steps to Medical Innovation”, which lists Bernard Munos’ strategic plan to fix what ails pharma. Munos came up with this list from his observations during a 30 year career in sales at Eli Lilly and his own personal research on the issue (more on Munos here). 1. Regain the trust of physicians, regulators and payers. I can’t argue with this point. Pharma has a bad reputation among all of these constituents, physicians most of all. A friend recently did a sales rotation and he said the tension (with many, but not all physicians) is palpable. For the most part, they would prefer to never see another sales rep again, but they do, mainly for the free samples. Many physicians are quite cynical about anything big pharma companies say and are always looking for the “catch”, assuming that drug companies have no qualms about bending the truth to increase sales. Improving the reputation of drug companies probably wouldn’t go far in fixing the R&D problem, but it’s an important goal, nonetheless. 2. Stop chasing blockbusters, which help lots of people a little bit, and start chasing breakthroughs, which help patients a lot. Hmm… not so sure about this one. Blockbusters “help lots of people a little bit”? I think one could argue that the statins have helped lots of people a lot. Just take a look at the long-term clinical trials and the reductions in cardiac events and death. Norvasc? Enbrel? Blockbusters too and huge steps forward in treating hypertension and arthritis, heck one might even call them “breakthroughs”. 3. Do what works. Stop trying to manage drug discovery with Six Sigma processes. Not sure how helpful “do what works” is, since if companies knew what worked, they’d probably be doing it. However, I can throw my support behind the disdain for big pharma’s attempt to industrialize R&D. I won’t say anything further on it, since it’s a widely recognized issue and has been commented on many times. 4. Lower costs with collaborative research. Hmm… again, not so sure about this point. I can agree that collaborative research has a lot of positive aspects: access to experts who are familiar with the nuances of a biological target, access to creative thinkers who don’t come from big pharma, etc. However, I’m not sure how much it will reduce costs. The expensive part of R&D is the “D” part and the numerous clinical trials that are run (I’ve seen numbers that breakdown R&D costs about 1/3 “R” and 2/3 “D”). Doing the pre-clinical work (where most collaborations occur and discoveries are fleshed-out) isn’t what’s driving up R&D costs. 5. Mitigate risk by developing lots of potential breakthroughs, not by trying to develop projects that seem low-risk. History says the risk is never low. 6. Don’t move anything into human trials unless it is a potential breakthrough. I’m combining these two points because I think they are related. I have a problem with Munos’ argument that developing lots of “potential breakthroughs” mitigates risk. What is the risk he speaks of? In R&D terms, it’s investing money in a project that fails to generate a positive return. The problem with his point is that even if you developed a lot of “potential breakthroughs”, they are just that potential breakthroughs. What makes or breaks a new drug are the clinical trials which is where most of the risk (and cost) lies. Pharma companies have plenty of “potential breakthroughs” (just listen to any pipeline presentation), what they don’t have is the money to send each one through the gamut of clinical trials. So choices have to be made. If Munos is arguing that the choices should be in favor of “potential breakthroughs” versus low-risk, incremental improvements, he’ll get no argument from me. 7. Cut research and development. If nothing else, Munos knows how to get people’s attention, and I think that was the purpose of how this point was worded. Delving a bit deeper, Munos suggests that pharma companies should cut their R&D by outsourcing it to small, independent research labs that don’t suffer from the “big pharma” mentality. This is already happening to some extent through the academic collaborations that almost every big drug company has (or is planning to) set up. Munos argues that this should go further and that big pharma should open up their R&D organizations to the outside, offering up their internal resources to outside researchers. Pfizer plans to do this with their academic collaborations where they provide access to internal Pfizer technology. It will remain to be seen how beneficial it is. So what’s the verdict? Munos makes some good points, but is a little lean on the details. My biggest concern is that this is being pushed as a “solution” to the problems of big pharma R&D and reeks of “if only these companies do X, Y and Z, everything will be better.” It’s that sort of thinking that got big pharma into the mess it is in today, with a top-down approach to R&D management. However, I do commend Munos for trying to change the system, because it certainly does need to change. Nature Reviews – Drug Development has an interesting article in their July edition by Michael Dunn of Ferring Pharmaceuticals out of San Diego (no subscription required!). Michael did some research on the timing of various R&D events and their impact on the total duration of marketing exclusivity for a given drug. It has some great background on how market exclusivity differs in the US and Europe and how events such as the filing of the first patent and the initiation of clinical trials impact the overall length of market exclusivity. I learned a few things from the article, so I thought I would pass it along. I’m confident that most of the readers of this blog are familiar with Zafgen Inc. and their new obesity candidate ZGN-433. The company is hot right now and for good reason: in a Phase 1b study, ZGN-433 produced a median weight loss of 1 kg (2.2 lbs) per week and follow-up cardiovascular data showed “rapid and significant” improvement in LDL, cholesterol, triglyceride and C-reactive protein levels. To give you an idea of how impressive this level of weight loss is, FDA guidance requires obesity drugs to produce at least a 5% decrease in body weight (over and above that seen in the placebo group) over a period of one year. ZGN-433 produced a median weight loss of 3.1%, compared to the placebo, in 26 days. You might be thinking, if these results hold for the phase II and phase III trials, Zafgen has a slam-dunk here! According to the CDC, 34% of adult Americans are obese and another 34% are overweight. What a market potential! Blockbuster? Of course! We’re talking mega-blockbuster here! In the past year, three different obesity drugs have been rejected by the FDA: Qnexa (Vivus), Contrave (Orexigen Therapeutics) and Lorquess (Arena Pharmaceuticals). They were all rejected for rare, yet serious safety concerns ranging from birth defects (Qnexa) to cardiovascular issues (Contrave) to tumors in a rat model (Lorquess). What is really surprising is that two of the drugs (Qnexa and Contrave) are combinations of previously approved drugs. The rejection of Contrave, a combination of naltrexone (an opioid antagonist) and bupropion (an anti-depressant/smoking cessation aid), was particularly surprising since both of the drugs in the combination are known for their high level of tolerability and safety. Of course, drug combinations can produce side effects that aren’t seen when either drug is used alone, but to reject Contrave despite the panel’s 13-7 vote to approve? What’s going on here? Well, the FDA is doing its best to predict the future and it doesn’t like what it sees. For the same reason that obesity is such a lucrative market (the huge patient population), it is also wrought with safety issues. The FDA is concerned that if an effective obesity drug were approved, it wouldn’t be just obese people taking it. Sure, in the beginning doctors would reserve the drug for the truly needy, those who have tried to lose weight but have failed and are experiencing serious health consequences as a result. But the FDA knows better. Soon enough, people who are 10 or 15 lbs overweight would be taking it. Then, people who want to lose those stubborn last 5 lbs would somehow get their hands on it (probably through an online pharmacy). After that? Well, if it works so well, why not just take it all the time, even if you’re not overweight? Or, if you want to make a weight class for wrestling, it can’t hurt right? And so on and so on. Soon enough, tens of millions of Americans will be taking the drug and likely a good percentage won’t be following the label or their doctor’s directions. The risk of <insert terrible side effect> is only two in one million? Well, pretty soon there will be enough patients crippled by the drug to form a line out of the back of the room during the congressional hearings. I’m sure it’s scenarios like this that cause the head of the FDA to wake up in the middle of night, her heart racing and covered in sweat as she envisions her career going down the drain. So where does that leave Zafgen? In a tight spot, indeed, but they do seem to have a game plan. In a Xconomy interview, Zafgen’s CEO, Thomas Hughes, says he’s already thinking about how to develop a REMS (Risk Evaluation and Mitigation Strategy) for ZGN-433. The company plans to target only the severely obese patient population and could use the REMS to control which doctors can prescribe the drug, which patient can receive the drug and which pharmacies can fill the prescriptions. It’s a great preemptive strategy for when it comes time to submit the NDA. Another encouraging factor is that the drug can only be administered via injection; no pills here. Normally if a drug can’t be taken orally it would be viewed as a negative, but in the eyes of the FDA, that will likely be seen as an additional barrier to widespread use. It will be interesting to see how the ZGN-433 program works out; an effective treatment for obesity is desperately needed, not only for the patients affected, but also for the country as a whole as healthcare costs continue to increase, in large part due to diseases like diabetes and heart disease where obesity is a major risk factor. I’ll keep an eye out for any news from Zafgen and be sure to post any relevant updates. Comment: It’s interesting to note that Zafgen has only three full-time employees. It’s a great example of the “virtual biotech” model that I touched upon in one of my earlier posts: Pitching to a biotech venture capital firm: what not to do.